Pinterest don’t have a built-in API for automated posts yet. You need to get a special API library module to be able to publish to Pinterest. API library modile is included in the SNAP Pro WordPress plugin. 1. Connect Pinterest to your WordPress. 2. Click green “Add new account” button, select “Pinterest” from the list. 3. 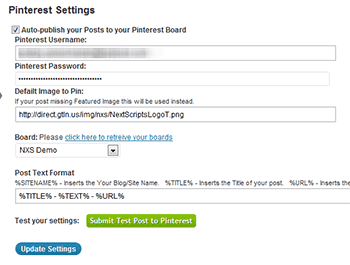 Fill Pinterest Login and Password. 4. Enter the URL for default image. It will be used in case your post don’t have a featured image. 6. Select default board to be pinned to. You will be able to select a different board during the post writing. 2. Your Pinterest is ready to use. Plugin will “pin” your “Featured image”. If “Featured image” is not set, it will take the first image in your post. If your post has no images it will take default image.